Nalin Verma’s upcoming book—“THE GREATEST FOLK TALES FROM BIHAR” is the reiteration of the oral tales that he has heard, lived and grown with in his village, Daraily Mathia in Siwan district of Bihar. Though he has drawn them from his own life spent with cowherds, shepherds and agriculturists in the mud fields of his small village—thrown carelessly on the map of Bihar-- the stories contain universal messages. They will satisfy the curiousity of the generation next youths living in America, England, Caribbean nations, Mauritius and several other parts of the of the world about the life and culture of their ancestors who migrated decades and centuries ago. At the same time the book is a painstaking effort at rescuing the stories that are dying with the change of time. It contains several of the rare stories that were never the part of the recorded history but lived down the villagers’ lips from generation to generation. They stand endangered in the storm of change today. The Indian publishing giant RUPA PUBLICATION is in the process of publishing the book. “Rupa is delighted to be publishing Nalin Verma’s The Greatest Folk Tales from Bihar in mid 2017. We as a publisher are committed towards publishing works that preserve our tradition, culture, and oral histories. Nalin has very carefully selected and documented these oral folk tales, narrated over a long period of time in the state, to present it for the new generations so that they can connect with their roots and culture. We are sure there are readers who are waiting to read this kind of work and also read these stories out to their children and grandchildren,” said Mr. Kapish G. Mehra, MD, Rupa Publications India. Nalin’s literary agency The Book Bakers and its chief, Suhail Mathur—himself a novelist and an editor of great repute—too said, “We at the Book Bakers are proud to have represented the book which presents the stories that entertained the audience for centuries in the hinterlands but are on deathbed today due to fast paced changes taking place in our society”. In fact,Nalin’s association with THE BIHAR TIMES too is as old as The Bihar Times is. 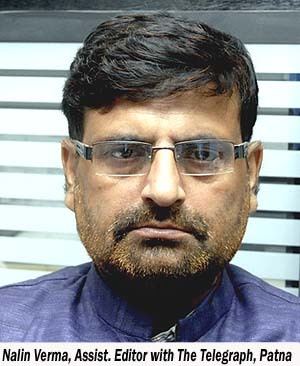 Nalin has been the founding columnist of this portal. The Bihar Times has countless readers across the globe who have enjoyed reading him over the years. His story on a village cowherd, Sukath Choudhary on this portal had fueled debate among the Oxford University scholars and was later reproduced by the NATIONAL GEORGRAPHIC magazine. We at the Bihar Times are extremely excited to introduce Nalin’s upcoming Book with the promise to our readers to keep on updating them about it in the run up to its publication mid this year. .